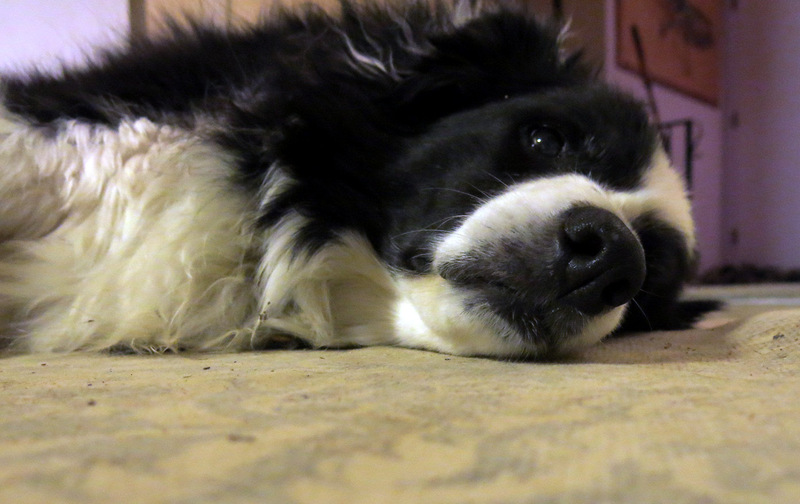 Hello everyone; once again it is I, Chess the purebred border collie, here to tell you all about my very boring day. You may remember me from such memorable posts as “Drip Drop Drip Drop” and “Under The Weather”, among so many, many others. Here I am in a characteristic pose. That’s our TV in the background there. It’s our only TV. I spent most of the day at home alone. All by myself. 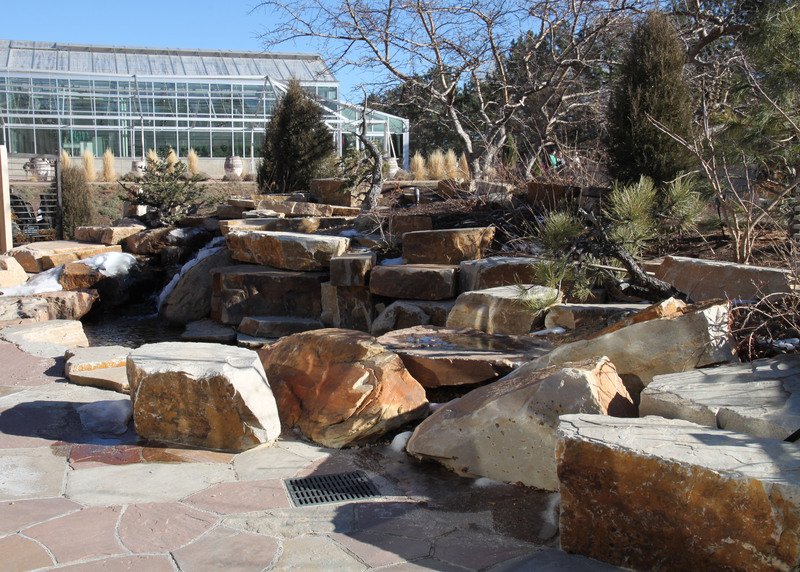 The guy I live with went to a place called DBG, which is Denver Botanic Gardens if you didn’t know, and they don’t allow purebred border collies in there, which I think is very unenlightened of them, but they still don’t. So I was left to, as the guy I live with says, “guard the fort”. I know he means the house and not my own personal fort, which you’ve seen me in. I’m very good at guarding the fort, and lot of people think I’m, like, totally vicious. A regular chompmeister. It’s true that I don’t like it when people come to the front door. A whole bunch of people came early one morning and took my mommy away from me, and then a year, less one day, later, the guy I live with and his sister took my buddy Slipper away, though I rode along with them. Then the guy I live with got this rescue dog who tried to kill me, or close enough, anyway. So I have my doubts about people who come to the front door, and I do a good job of guarding the fort. Of course if you turn out to be someone who the guy I live with likes then I’m a complete angel. I am in fact very angelic and just play the totally vicious part really well. One thing about DBG. The guy I live with has trouble going places by himself, since he and my mommy went everywhere together, even to the doctor, and he always feels disoriented and lonely when he goes out by himself, but at DBG he feels very comfortable and happy. And sometimes really, really jealous, but he says he’s too “advanced” to admit that. 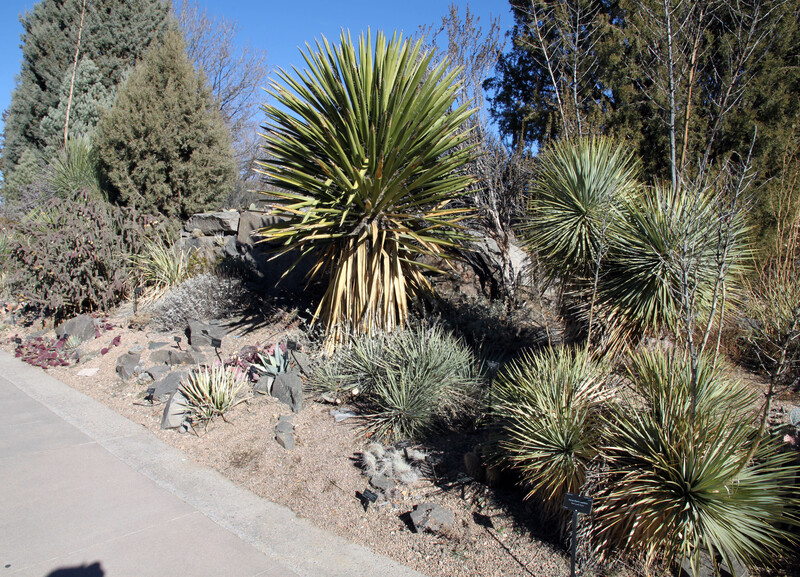 Anyway, here are some pictures, starting out with some Yucca rostrata. Oh. 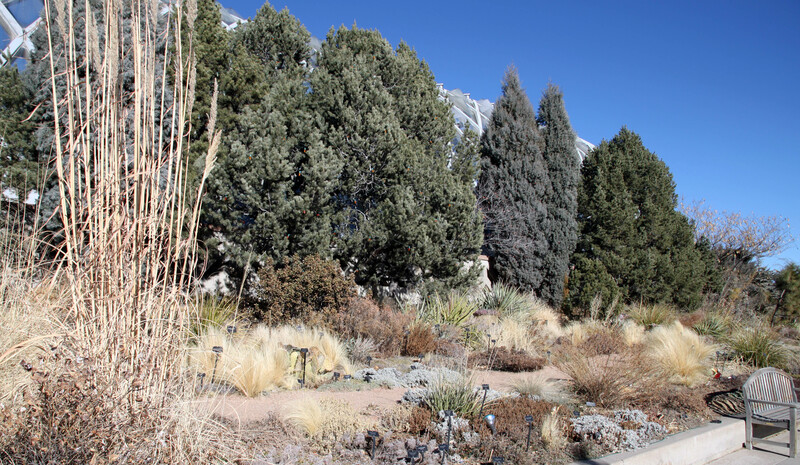 You see those two really blue conifers there, in the picture below, those are Cupressus montana, the cypress from San Pedro Martír in Baja California, where they grow at elevations up to 11,000 feet (3353 meters), and yet they’re still hardy here in Denver. Isn’t that odd? We have one in our garden, too. This is Panayoti. I know him, so I wouldn’t chomp him. 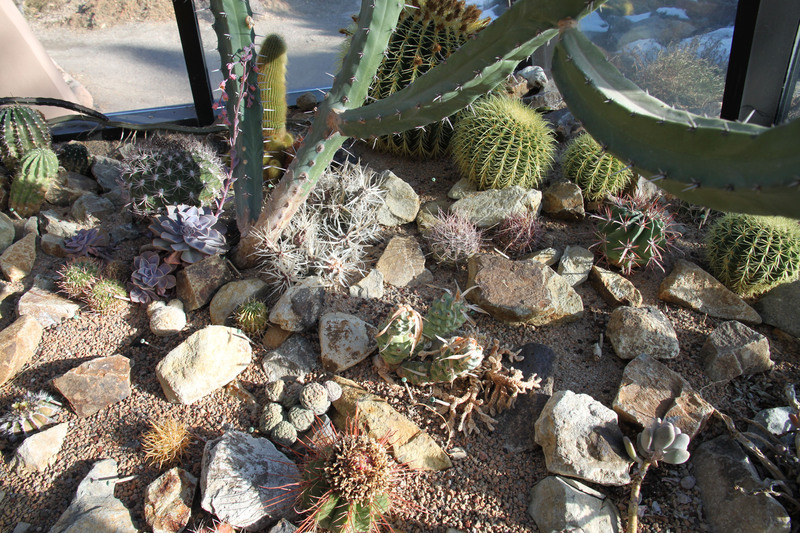 what’s in the alpine house now…tender succulents. very cool. 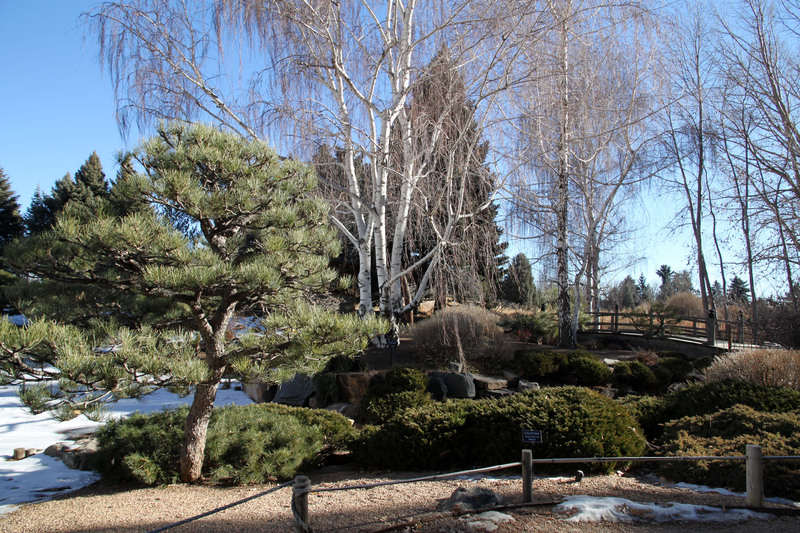 Now some views of the Japanese Garden. Eventually, of course, the guy I live with came home, and I was very happy indeed. He cuddled me and said how sorry he was, and I got my dinner, and we went on our walk in the dark. Walks in the dark are excellent, because I can see really well. I guess that’s pretty much all for today. Life is back to as normal as it can be around here, now. 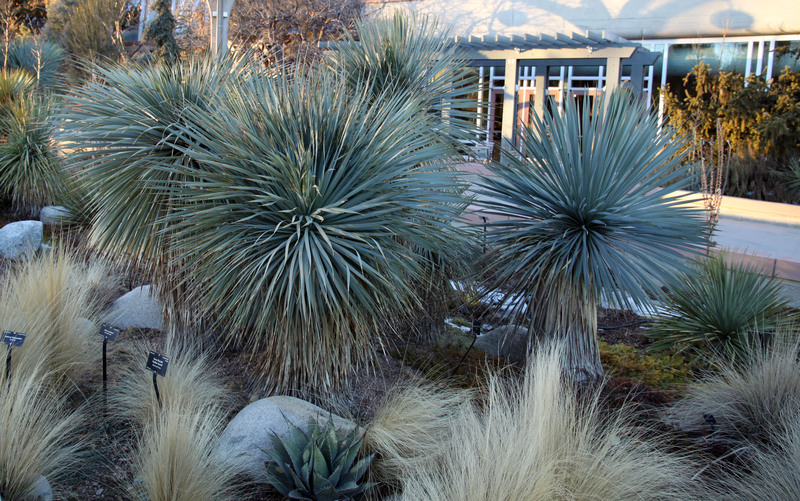 This entry was posted in Uncategorized and tagged Cupressus montana, Denver Botanic Gardens, Yucca faxoniana, Yucca rostrata. Bookmark the permalink. 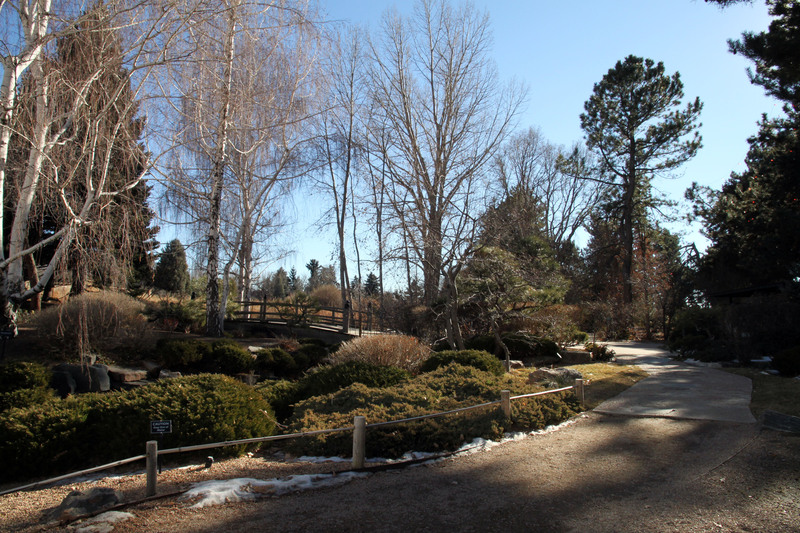 It was a beautiful day today, and the gardens were gorgeous as usual. I can understand why you don’t like folks coming through the door, Chess. While I was reading your blog, dear dog, Pandora decided to play Someone to Watch Over Me, lugubrious version. Swear to the Goddess I have to start listening to more cheerful music – are the BeeGees cheerful? – while reading your thoughts or I’ll become a miserable gardener Coronado version. I can see in your closing photo you are keeping an alert eye on the guy you live with to make sure he stays in place. DBG looks like a good hiking spot as all excellent botanic gardens are. My friend Loddie, the heritage rose curator, will soon be out at the Huntington, and maybe she’ll show me photos of the heritage roses so I can act all advanced. We’ve been guests (paying) of a ranch at the base of San Pedro Martir. At the top is a big and famous observatory taking advantage of the (so far) clear skies. In our tiny garden we have a native California cypress I’m trying to talk into Keeping Small. My husband has entered the bookroom bearing a Szerac cocktail, so I too must sign off until next time. I must say it’s kind of annoying the way people who come to the door think I’m all vicious and everything, because I’m just the opposite, but, being a dog, it’s my job to guard things. It’s just that I have this thing about people coming to the front door, which, after hearing all the things that have happened here, you’d think people would understand. Maybe they don’t want to. Humans are kind of weird that way. They assign a label to you and then that’s that. The guy I live with lets people come in through the garage, and then into the kitchen, I say Hi, and things are okay. The guy I live with also rolled his eyes at the Bee Gees. Back in the days when, say, he was writing books, he’d listen to Duke Ellington and drink red wine. My mommy liked that music too and it made the house feel very warm and cozy and stuff, like the gleam of a candle in an otherwise dark corner of the house. He mostly listens to opera now, and there’s an awful lot of screeching. Lately, though, he’s been having these what he calls “musical evenings”, where he sits at the laptop and looks at stuff, mostly language blogs (like “language log” and “the stroppy editor” and “bradshaw of the future”), listening to music while I snore away in my fort. I like this a lot. He says that DBG is excellent for walking around. So nice to see the DBG pictures. What you wrote is why I worry so much about my good friend whose husband is ill. Because they go everywhere together. Even though she and I are good friends we don’t do stuff except visit each other’s gardens. (We are almost neighbours.). That is the kind of love that makes it so hard when you have to do stuff by yourself. So I worry. It’ll be five years this May; it’s still hard to do things alone. Or, not hard, but extremely boring. Very pleased with the new lens and its ability to take in “the bigger picture”. I strongly remember the comment reply that you made about not caring about “the future”. It wasn’t morbid just factual and I just want you to know it has stuck with me as I was very moved by the picture you painted of what grief is like. You’ve probably read The Year of Magical Thinking. Or not. Maybe it does no good at all to read books like that. Never read the book, know of it, though. It is a shame that purebred border collies aren’t allowed in Botanic Gardens. The garden staff could use you to keep unruly children under control. The garden experience would be more pleasant for all of us. 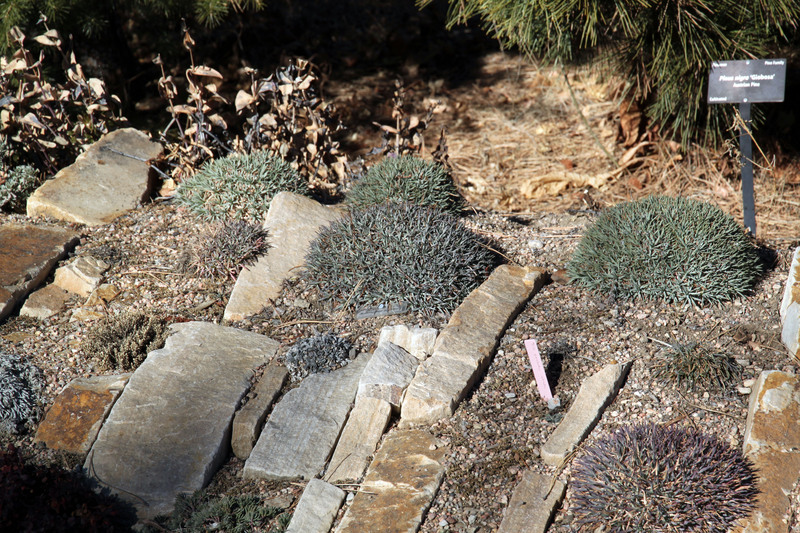 I have mixed feelings about those crevice gardens. Perhaps they will look less contrived in the spring? They guy you live with should hand all visitors a treat to give you just before they enter your house. You get a snack and they get a nice welcome. A tour guide. That would be excellent. We don’t have a crevice garden here, because the guy I live with didn’t want to spend a whole bunch of money on rock. Sorry ….stone. He rationalized this by saying that even though stone was easily obtainable here, the mulch and stuff should technically be of the same material, and that’s impossible unless you go get your own, from the mountains or some place. 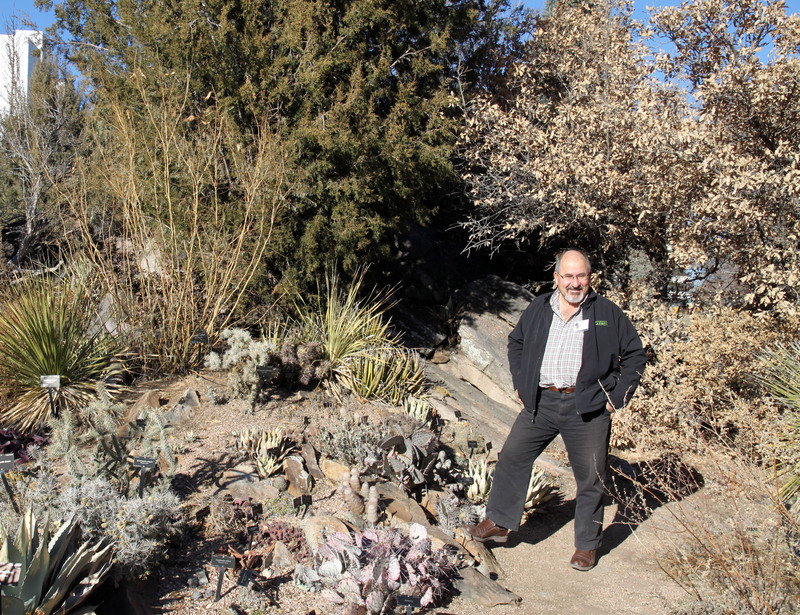 Mixed feelings are common when talking about crevice gardens. 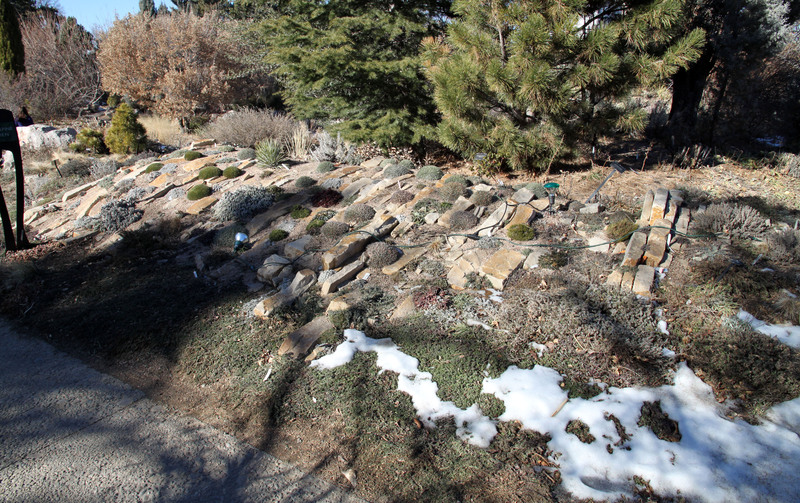 Crevice gardens, though, are becoming increasingly popular in regions with humidity and winter rainfall, to help keep the plants dry. 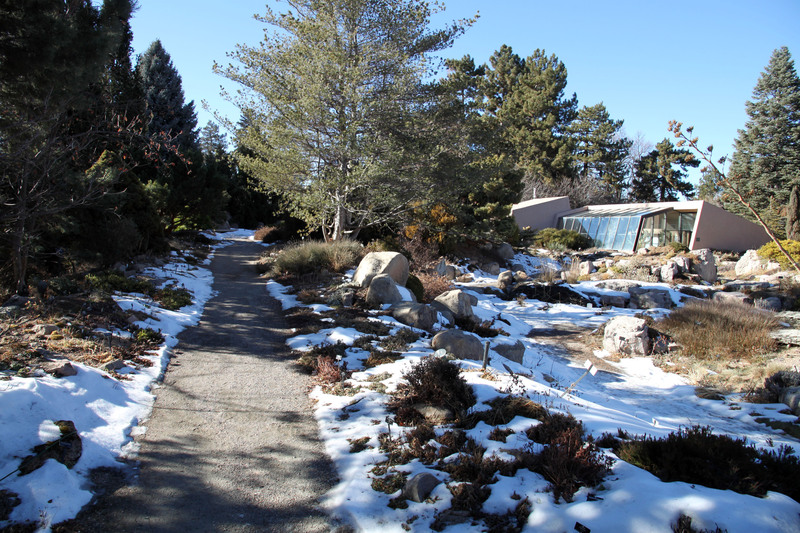 Alpine plants are mostly grown in troughs here, and the troughs are frozen solid right now. Hi Chess! Sorry you had to spend the day alone. You commented about how the guy you live with has a hard time going places by himself since your mommy died… well, I had the same thing happen to me when my husband died as we were together almost all of the time. When I would go anywhere, all these memories would fly into my head and make me sad – they still do, and it’s been a few years. You see, us humans have a love/hate thing going on with our memories. We want to keep our loved ones alive in our memories, but doing that sometimes brings sad feelings and melancholy (a big word that means a feeling of deep sadness or gloom). Eventually, those melancholy feelings will subside, but they will never go away. My dogs (Karelian Bear Dogs, also purebred and almost as intelligent as you are) have helped to relieve so many of my feelings of loneliness and sadness, as I am sure you do for the guy you live with. My dogs suggest you talk with “the guy” about getting training to become an official service dog. Then you can accompany him on trips to the Botanic Gardens, as long as you behave and control your bathroom urges! Just a suggestion. Although, you may also want to keep things status quo and just learn to enjoy your alone time! My husband also passed away in May — May 20, 2008. Sometimes it seems like a long time ago, sometimes just yesterday. BTY: Kelly wanted me to take a picture of the agave seedlings you gave to him after I finished w/ them, he thought, you thought we didn’t do anything with them, we did. No picture. No, we figured they would be “grown on”, as they say in the U.K.
You and me, Chess; we’re neither of us what you would call “people persons”. My default mode, when it comes to people, is also a snarl. I bark too: at people with a full shopping cart in the 10 Items Or Less line at the grocery store, at guys in movie theaters who check their email while the rest of us are trying to watch the damn film, at drivers who are too busy updating their Facebook page to notice that the light has turned green etc. I just started anger management therapy. My goal is to be less like a pure bred boarder collie with justifiable front door/boundary issues and more like a golden retriever. 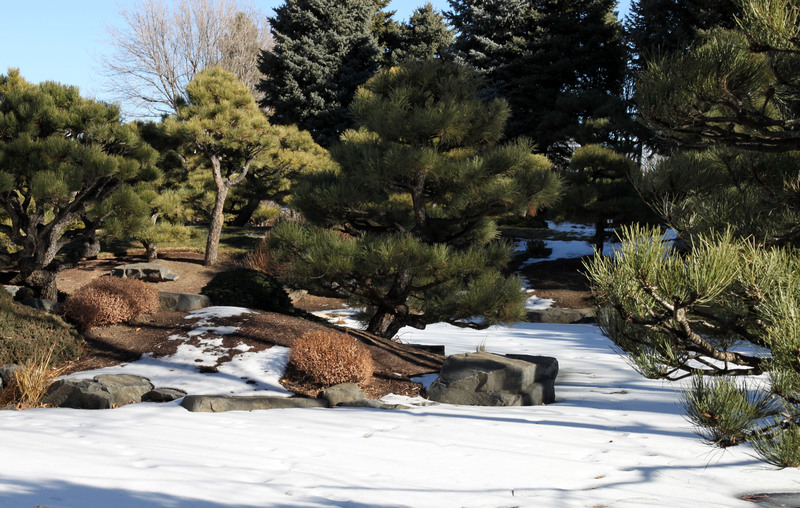 We have a “Japanese” garden here on Long Island that calls itself a “stroll garden”, which is laughable since it’s only 4 acres and also contains Zen references and a tea house. Stroll gardens date from Heian-era Japan and were usually huge (10 acres, minimum) and were created long before Zen Buddhism and tea became part of the national consciousness. I’m not a garden snob but I have come to dread “Japanese” gardens in North America, which are as Japanese as that Monet-replica garden in Kitagawa is Giverny. OK. Maybe I am a garden snob. Chess, I am so sad that your Mommy was taken away from the guy and dogs for whom she was the light and flavor and purpose of life. I can understand why you like to take naps so much: for the dreams. I too lost someone I loved very much and whenever I had a dream of him I’d wake up happy, and that joy would last sometimes for a whole hour. 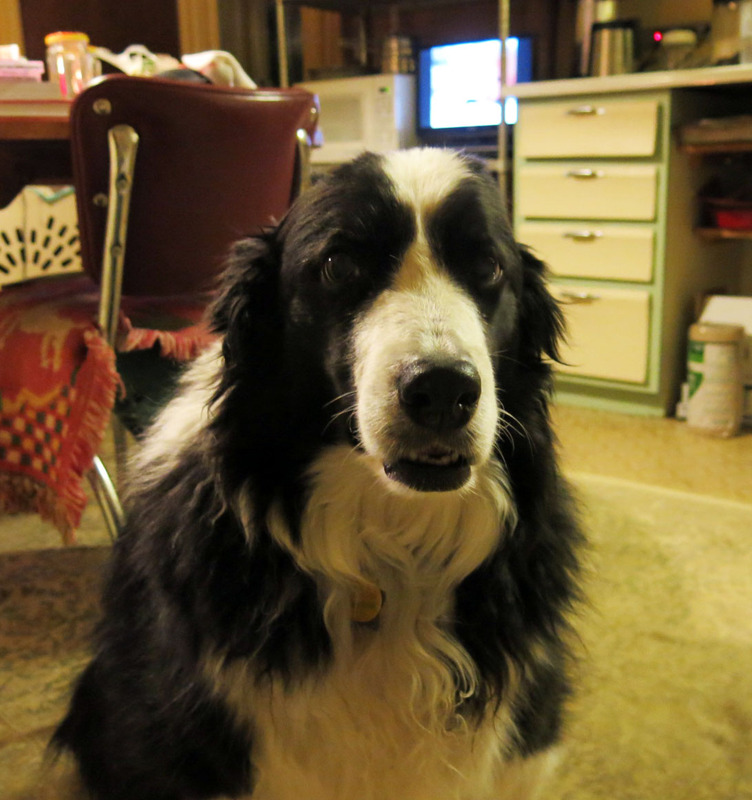 Anybody who reads your blog has come to know your Mommy, a little, not as much as a pure bred border collie, but just enough so that we all miss her too. Yeah, thanks. A golden retriever got out of his yard the other day, and I was just minding my own business, enjoying my walk, and he tried to chomp me. Fortunately the guy I live with yelled at the retriever and it slank away. (He says that’s not English. Slink, slank, slunk.) The guy I live with also made a comment about what you might call zen this, zen that a while back. https://paridevita.com/2012/09/15/the-zen-of-planting-manzanitas/ He went through an anger phase, couple of years ago, mostly directed at his neighbors, but that passed. He realized that I was thinking all this anger was directed at innocent little me. Thank you for the DBC photos, lovely every one. No, thank you. 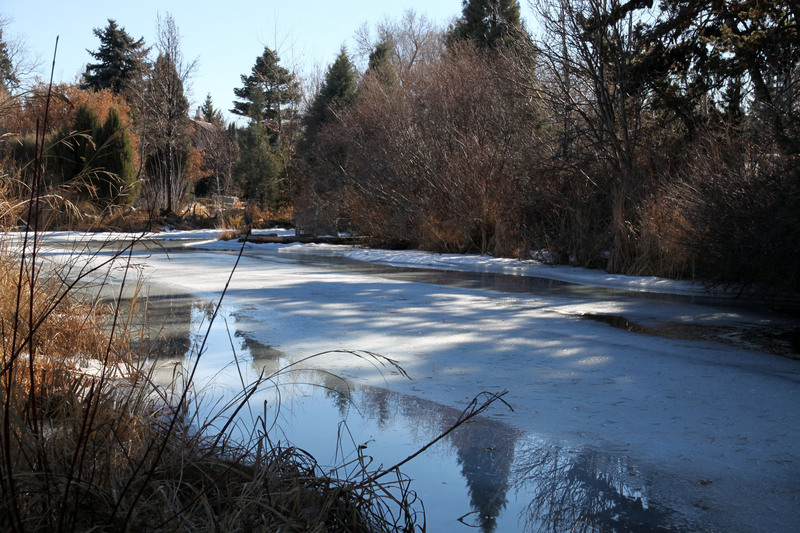 It was a gorgeous day, a bit sunny for taking pictures (much like every day). 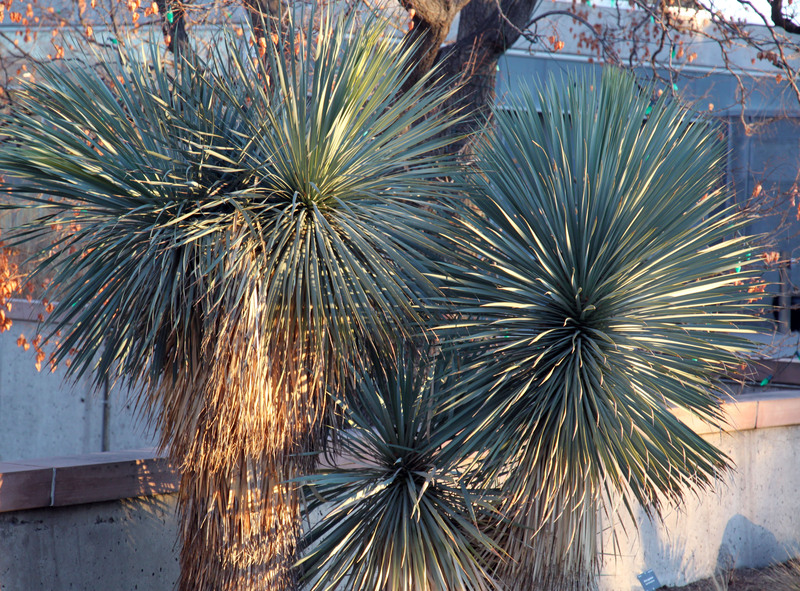 Oh, those yuccas ….. I know all about barking. The dogs I live with are very barky dogs., and they have lots of different barks. They have barking at squirrel barks, and barking at people in the distance barks, and OH – MY – GOD – SOMEONE’S – ON – OUR – PROPERTY barks, and then there’s someone’s at the door cacophony of barks. Our doorbell was broken for 2 or 3 years, but it didn’t matter because I always knew when someone was there. Doggie doorbell. To tell the truth, I’m kind of glad they bark at people who come to the door because I’m home alone a lot. I tell them I appreciate that they take their guard dog duties so seriously (I know it’s probably watch dog duties, but guard dog sounds better to me). I just wish I had the skill to train them to stop barking on my command. I understand training them to stop on command entails first training them to bark on command. That’s the hard part. Even though they are very barky dogs. One of the things I know about barking is that dogs intent on biting generally strike in silence, so I don’t mind when dogs bark at me. This past summer my dogs took barking to a whole new level, a thing I call “The Howling”. It happens when I’m outside and they’re inside. One of them starts to bark, then they all bark. Then one starts to howl, and they all howl. I can’t see or hear anything that set them off, but they keep it up for 3 or 4 minutes, until I can’t stand it anymore & come in to see what’s going on. I open the door to the house to find 3 dogs standing silently, wagging their tails and looking at me expectantly. They did this last week when I was out planting tulip bulbs and sticking my meat thermometer in the ground. They did it again yesterday when I was cleaning the master bath at the very back of the house (out of sight). I think it’s a canine version of “Ha! Ha! We made you look!” I do not like this game very much. If you ask me, the dog, the reason why I bark a lot when people come to the front door is that my buddy Slipper said that’s what we do, because my mommy was home all the time. She quit the phone company in January of 1983 and didn’t work after that. She would read and draw and make things, instead of working. So, someone had to guard her. This really isn’t a neighborhood where guarding is necessary, but we felt it was, and I still think so. It’s also important to let humans know about changes in conditions. Like if something is always the same, and then it changes, humans need to know. Say the sidewalk two blocks away doesn’t have a cat walking down it, and now it does, well, then, humans need to know. Humans may not think this is important, but they don’t know everything. I have always felt protected by the dogs I live with. About 20 years ago, when we lived in Flint, we had a guy come to fix our computer. After he’d been there a while, the young man asked if I’d noticed that Jake (my black & white terrier mix) always kept himself between me & the guy. I hadn’t noticed, but I watched Jake do just that the entire time the guy was there. And any time any stranger was there. He was 22 lbs of fierce loyalty, he was. My first dog, Suzy, was very good at noticing changes. We lived in an apartment, and she liked to lie on the flat back of the couch & look out the window which overlooked the parking lot. Sometimes she would sort of growl under her breath, and it took me a while to figure out that she only did that when a car that didn’t belong to a tenant would pull into the lot. She could tell by sound which cars belonged there & which didn’t. I always feel guilty about Suzy because I didn’t know much about dogs back then & I think I could have done some things better with her. She was a harrier, and I’ve since come to believe that scent hounds don’t necessarily like being house dogs. I forgot to mention that the dogs I live with also have special barks for other dogs. Sammy always barks when Annie, the golden retriever rescue from 3 houses down, walks past our house, but not at any of the other dogs that go by. Buddy has a weird high-pitched yip that he only does when we’re walking past Ellie’s house, 3 houses up from us & on our walk route. Ellie barks from inside the house & runs outside to bark some more from behind their privacy fence. The guy she lives with tells me that all he has to do is say, “poodles,” to send Ellie into a frenzy of barking & running around. We found out the hard way that this barking is not friendly play. They really seem to hate each other. I can’t fathom why. P.S. I think your mommy was working even when she stayed home. At least, that’s how I think of myself. Even when I was teaching (part-time) I only went to campus for class & did most of my work at home. Now that I’ve ‘retired’ (read: been made ‘redundant’), I still work as much as ever, maybe more: I just don’t get paid. I have an arch-enemy. Her name is Lola, and she’s really little. She looks like a mop, with legs, but I know when I walk by that her sole interest is to chomp me. Chomped by a mop. My mommy didn’t always really work. She sometimes wrote in her notebooks, or called the guy I live with at work, or sat out in the garden with me and my buddy Slipper. One thing she really, really liked to do was weed. She loved weeding. There are a lot of weeds here so she had plenty to do. I always just watched.